According to Robert “Derb” Goodman, the flags at the Veterans Memorial and around the the community have been lowered by the Hopkins County Marine Corps League. 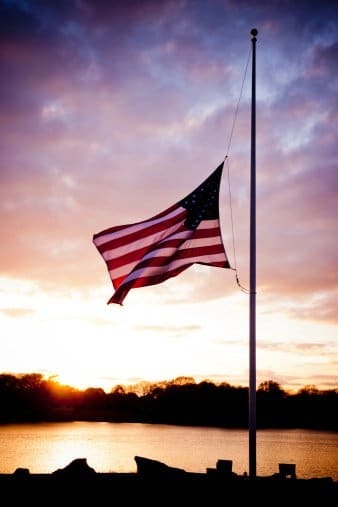 At the death of former President George H. W. Bush, President Donald Trump has proclaimed that all flags should be flown at half-staff. In his proclamation, President Trump stated, “It is my sorrowful duty to announce officially the death of George Herbert Walker Bush, the forty-first President of the United States, on November 30, 2018. “President Bush led a great American life, one that combined and personified two of our Nation’s greatest virtues: an entrepreneurial spirit and a commitment to public service. Our country will greatly miss his inspiring example. “The same unselfish spirit that motivated his business pursuits later inspired him to resume the public service he began as a young man. First, as a member of Congress, then as Ambassador to the United Nations, Chief of the United States Liaison Office in China, Director of Central Intelligence, Vice President, and finally President of the United States, George H.W. Bush guided our Nation through the Cold War, to its peaceful and victorious end, and into the decades of prosperity that have followed. Through sound judgment, practical wisdom, and steady leadership, President Bush made safer the second half of a tumultuous and dangerous century. “Even with all he accomplished in service to our Nation, President Bush remained humble. He never believed that government — even when under his own leadership — could be the source of our Nation’s strength or its greatness. America, he rightly told us, is illuminated by “a thousand points of light,” “ethnic, religious, social, business, labor union, neighborhood, regional and other organizations, all of them varied, voluntary and unique” in which Americans serve Americans to build and maintain the greatest Nation on the face of the Earth. President Bush recognized that these communities of people are the true source of America’s strength and vitality.